WBW #41-White Friuli Wines Round-up Posted! Jack and Joanne have the WBW round-up posted over on Fork and Bottle! Looks like around 43 participants this time, and a ton of wines to read about, as many people tasted two or more Friuli wines for this WBW. Head on over to Fork and Bottle to see what everyone tasted this month, and watch out for the next WBW announcement which will be coming from Spittoon. Filed under: Fork and Bottle, Spittoon, WBW |	Comments Off on WBW #41-White Friuli Wines Round-up Posted! Jack and Joanne of Fork and Bottle are our kind hosts for this edition of WBW, the brainchild of Lenn of Lenndevours. The task they set us to for this month was to find a white wine from Friuli, any white we wanted. Though they suggested that we spend $18 or above or else we might be disappointed in the wine we chose. The wine I finally found was a Livio Felluga 2005 Tocai Friulano. I purchased it at MV Wine and Spirit in Madison, CT, it cost $27, had a real cork closure and clocked in at 13% alcohol by volume. First impression: I can smell the floral bouquet across the room. After I buried my nose in the glass (as is my habit, much to both the delight and chagrin of Matt…delight because it means I drink less of the bottle, chagrin because I chide him for drinking more than his share!) I found peach, tropical fruit, almonds, and apple. The flavors were a bit bitter. In the mouth I got flavors of pear, peach, apple, tropical fruits, almonds, and spicy white pepper. I would describe this wine as lively in the mouth. It was refreshing and fun, and very nicely done. I served it with Roz’s Zuppa Toscana, and it was actually a really tasty match with the slightly creamy flavors of the soup. It did really well cutting through the soup and reviving the palate. My only reservation is the price tag. It’s more than I’m willing to pay for an unknown bottle, but both Matt and I really enjoyed what was in the bottle, Matt wants to get it again! Though I have no idea where to find it around here, so that will have to wait. And a bonus! We went out to dinner last night at the Sonoma Restaurant and Wine Bar in DC and they actually had several bottles of Friuli wine on the menu. I suppose that’s one of the great things about WBW, it causes me to keep my eye out for new things. I never would have even noticed “Friuli” before this WBW because I knew nothing about the region. So true to my nature as an inquisitive wine blogger, I had to jump at the chance to taste at least one. The restaurant offered tasting sized pours of one of the Friulis, $5 for 3 ounces….which I must say, was a VERY generous 3 ounces! The wine was a 2006 Di Lenardo Vineyards “Toh” Tocai Friulano. You could purchase the whole bottle for $35 if you wanted. In the glass, I noted the golden straw color of this wine, something I also noted about the Livio. On the nose I found lemon, herbs, almond, passion fruit, and peach. In the mouth there was lemon, almond, tropical fruit, and peach. Overally, the dominating flavor and aroma in this wine was peach. The wine wasn’t nearly as lively in the mouth as the Livio, but it was still quite tasty. I enjoyed my foray into Friuli and I will definitely keep looking for more bottles from the area in the future. It also helped me gain a new grape variety as I had never had a Tocai Friulano before! Thanks to Jack and Joanne for hosting, and I look forward to the round-up! I’ve been remiss in posting an announcement for the next edition of WBW. Jack and Joanne of Fork and Bottle have chosen the theme for WBW this month, picking white wines from Friuli. You can pick any white wine you would like from the region, though they caution you that wines priced under $18 may not deliver much bang for the buck. All the details are available on Fork and Bottle. The varietals from the region run the gamut, you can find Riesling, Sauvignon Blanc, Chardonnay, among many others, however, speaking from personal experience, and the warning on Fork and Bottle, the wines are NOT easy to find. I went to 4 wine shops before finding anything, so if you are going to participate, get going, the deadline to drink and report on your bottle is January 16, which is rapidly approaching! I’m looking forward to this WBW since this is a wine region about which I know next to nothing, so the round-up should be an excellent way to increase my knowledge. Many thanks to Jack and Joanne for hosting! But I’m all for good wine, even when I’m not totally convinced of the biodynamic process behind it. I’ll also be the first to admit that I don’t totally “get” the whole biodynamic thing. I’ve read about it over the past month to see if I could educate myself, but I’m still not sure I’m totally on the same page with what is going on. Protecting the environment and trying to use the land with the least harmful impact is great in my book, I’m just not sure I buy into all the swirling of things in a certain way and burying items at proper times in the skulls of animals. Nonetheless, what I drank tonight was a fabulous bottle of wine. 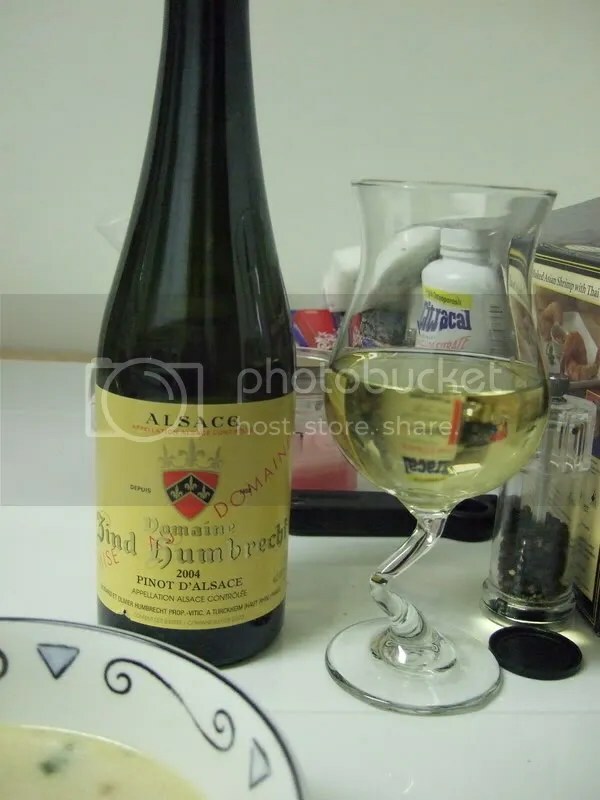 This bottle of Zind Humbrecht 2004 Pinot D’Alsace came highly recommended as a biodynamically produced wine from the associate at the Curious Grape after she kindly check in their computer for me to make sure that it was indeed biodynamically produced. It ran $23, had a real cork closure and is 13% alcohol by volume. This is a blend of two different grapes, in 2004 it was made of 70% Auxerrois and 30% Pinot Blanc. On the nose of this wine I get honeysuckle, tons of minerals and exotic spices. There’s also a hint of citrus and I almost want to say that it’s a clementine orange. In the mouth there is citrus, with a hint of the honey I got on the nose. It is crisp and biting and has a long mineral filled finish. I paired this with the last of Roz’s Zuppa Toscano recipe and it actually wasn’t a half bad match. The soup is both spicy (with the Italian sausage) and creamy (with the whipping cream) and the tart acidity and excellent structure of the Zind held up well to the flavors. Given the opportunity I would buy this wine again. It’s a bottle right up my alley with the crip citrus flavors and the lasting minerals. I’m also a sucker for an aromatic nose that follows through in the mouth. Even Matt proclaimed this a “tasty wine” and he’s usually not one for a wine that is mostly tart and crisp on the flavors. Thanks to Fork and Bottle for hosting this month’s WBW and for making me step out of my normal zone to search for a new wine. I almost forgot that it was today, which would have been a shame since I went out and bought a bottle specially for it! Thanks to Huevos con Vino for reminding me (overachiever, he already has his post up! 🙂 ). So the deal is, drink a bottle of biodynamically produced wine and post the review today. Then submit your link and other pertinent info as specified to Fork and Bottle at some point today. There’s still time to go out and pick up a bottle if you want to participate. The days are slipping my mind this week, as we had Monday off and Friday is my regular day off, today just doesn’t feel like Wednesday (plus, I’m planning a dinner party for Matt’s co-workers on Friday, so I’m a touch distracted! ).